Phragmites australis has a high genetic variability which is augmented by its clonal growth form and its cosmopolitan distribution. Genetically different lineages from different parts of the world show differences in morphology, time of flowering, length of growing season, biomass allocation and various physiological characteristics. However, genetically identical individuals may also produce distinct phenotypes when exposed to contrasting environments. The phenotypic plasticity of a genotype is important for its ability to adapt to temporal environmental change. Thus, a high phenotypic plasticity can be seen as a functional response maximizing fitness in a particular environment. Lack of phenotypic plasticity may lead to decline in a changing environment, whereas high phenotypic plasticity might be associated with aggressive expansion. This paper will summarize the findings of recent research on the phenotypic plasticity of two geographically distinct genotypes originating from the cold-temperate Denmark and the warm-Mediterranean Algeria, respectively. We studied the interactive effects of temperature, CO2 and fertilization level on growth, physiological and biochemical traits in order to quantify the contribution of plant trait plasticity to fitness. Additionally, we present data showing how photosynthesis of four distantly related genotypes co-existing in the Gulf Coast of North America differs, both in situ and when grown in a common controlled environment. We will present data showing that degree of phenotypic plasticity as well as plastic traits differs between genotypes, and suggesting that environmental conditions at the site of origin affect plasticity. The origin and genetic background of Phragmites lineages play a substantial role for their physiological ecology including their ability to disclose plastic traits, when exposed to contrasting environmental conditions. 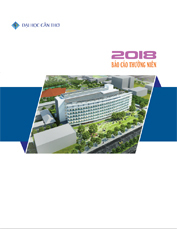 Tạp chí: 11th International Congress on Engineering and Food. 22-26 May 2011. Athens, Greece. STABILITY OF ASCORBIC ACID DURING THERMAL AND HIGH PRESSURE PROCESSING. APPLICATION OF NITROGEN-FIXING BACTERIA AND PHOSPHATE-SOLUBILIZING BACTERIA ON STICKY RICE GROWN IN AN ALLUVIAL SOIL IN VIETNAM. Tạp chí: Asian Seminar "Sustainable Biomass Production by Microbial Symbiosis and its Bioconversion in Southeast Asia"
Tạp chí: Proceeding of 13th International Summer Symposium, International Activities Committee, JSCE,Kyoto, Japan.